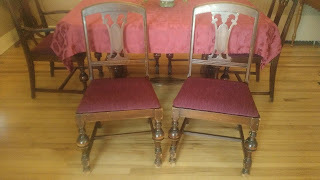 Penned Without Ink: A Fresh Look for Some Old Chairs . . .
A Fresh Look for Some Old Chairs . . .
Last week's frigid temperatures kept me inside with a project that had been on my list since last fall. 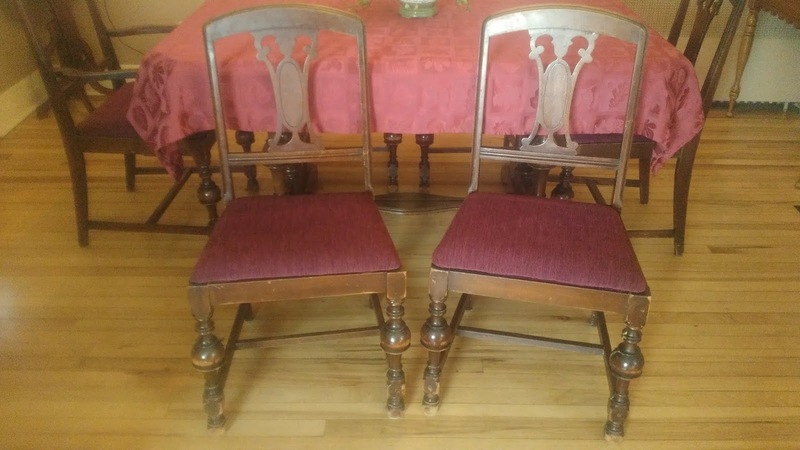 I recovered my dining room chairs. I had enough of the same fabric to recover four of the six, and since the fabric is reversible, I just turned two of the old covers over. Much better! Mission accomplished. 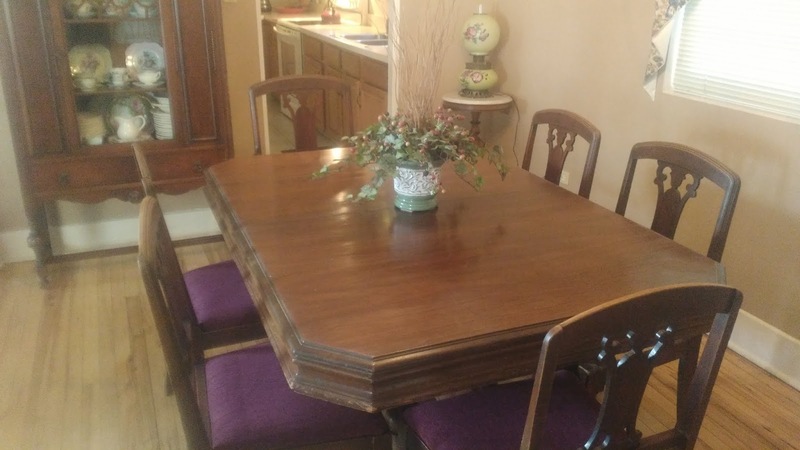 As I stapled away using my kitchen counter as a work bench, my mind wandered to the history of the table (with two leaves), chairs, matching china cabinet, and buffet. As the story goes, my great-grandmother purchased the entire set in 1929. Ninety years ago! At that time she was 48 years old and only enjoyed her new furniture for six years before she passed away in 1935, a year before my dad was born. After the Depression, Dad's immediate family moved in with relatives for a time where he remembers seeing the set in the middle room in the upper family flat on Edison Street in Buffalo. As a young girl, I remember this same furniture in the same house in the same room, arranged the same way. (Dad and I compared notes over dinner the other evening, drawing out the floor plan and furniture arrangement.) By this time, my great Aunt Anita and her brother, Uncle Freddie, lived there. Sometime in the mid-80s, while Barry and I lived in Rochester, NY, my great aunt sold the house, and the furniture was given to me. I was thrilled. We hauled the chairs into our front enclosed porch and began the painstaking task of refurbishing the seats, by now in need of repair. 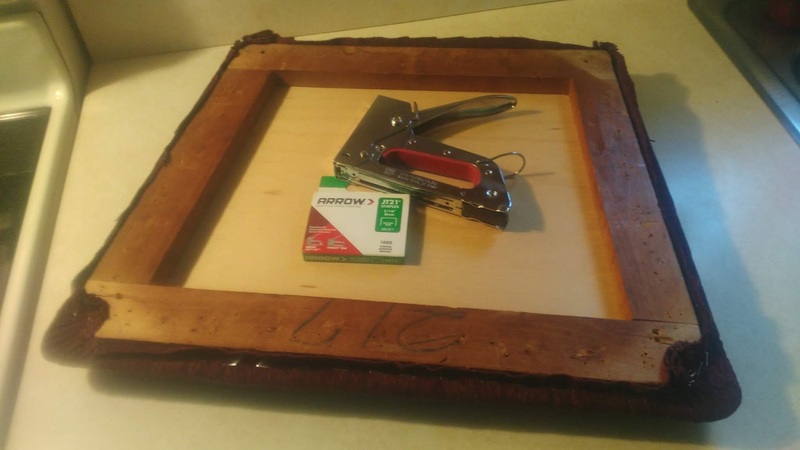 Barry removed the tiny tacks and old straw "padding" and nailed thin boards onto each seat frame. frames to an old fabric warehouse in Rochester and left with foam, batting, material, and determination. Over the years I've changed the seat fabric many times. By now the chairs creak, the legs look worn, and a few of the wooden frames have grown brittle, yet I've managed to cover the seats by improvising here and there. If my chairs could speak instead of squeak, what stories they would tell! 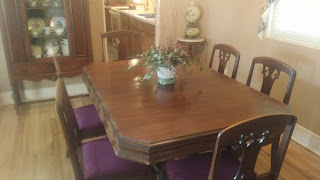 Six generations of families have sat in them around the old table. . . telling stories over spaghetti dinners, birthday celebrations, and Saturday night suppers. Children wearing bibs have graduated from booster seats. Guests have come and gone. Shared memories keep traditions alive. I still treasure the times when family and friends gather. Most recently, a ladies' Bible study, my writers' group, and a Moms in Prayer meeting gather around the table on a regular basis, using the same chairs my great grandparents, my grandma, my dad, my children, and grandchildren have used . . . all to the glory of God. Thanks, Sarah, for another of your (always) heart-warming posts and (as this one says, at the end), "all to the glory of God". Blessings, Steve and Judy. Seems there's always another story to highlight God's grace! 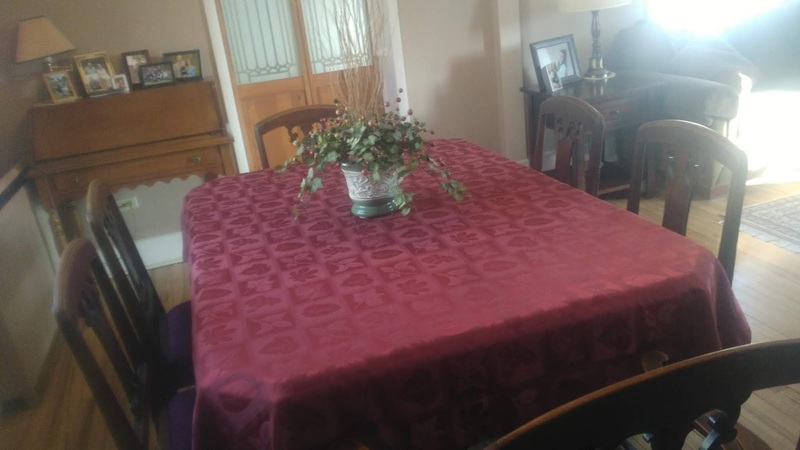 I have a similar table and chairs, and we are on our 5th generation around the table. No place in my home engenders more nostalgia and memories than the old dining room table. Love your memories. Thanks, Jo Ann. "Nostalgia and memories" are the treasures of life! They ground us as we look toward the future . . .